Discussion in 'Online Games - News and Reviews' started by Marina, Nov 25, 2013. Christmas is coming early this year with Microgaming's release of Secret Santa. Santa always says, "Ho, Ho, Ho". Well with this fantastic, 1024 payline video slot, you'll be saying "Ho, Ho, Ho" all the way to the bank. A cheery Christmas themed slot that has all the iconic holiday symbols you'd expect. You can almost smell the Turkey roasting. Feel the heat from the roaring fire and settle down for some nice Christmas pudding and hot chocolate. Will you hear the bells jingle for this Christmas spectacular slot? Jingle all the way to winning some serious loot. 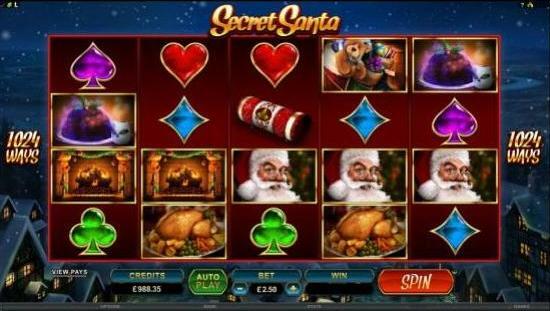 Secret Santa is a fantastic online video slot from Microgaming. From the title alone, players will be in for secrets to earn them some riches. With 7 fantastic bonus rounds to get and introducing Five of a Kind, players will surely be stuffing their stockings. 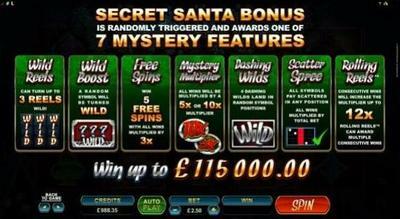 Secret Santa is a 5 reel, 4 row, 1024 ways online slot machine. You can chose the number of coins and bet amount to play per spin. which can be won whenever 3 or more appear anywhere on the reels. The wild symbol which is the Secret Santa logo substitutes for all symbols except the Scatter symbol. Turkey, Christmas Pudding, Spade, Heart, Diamond, Club. At any time during game play, the bonus feature can be randomly activated. There are a total of 7 mystery features to be had. Receive anything from Wild Reels where 3 reels can turn wild and make some great winning paylines. Wild Boost, where another symbol will be wild to increase your chances of getting a winning payline or two. You could win 5 FREE SPINS with a multiplier of 3x's. Dashing Wilds occur and and the Dashing Wild symbol could be anywhere on the screen to create incredible wins. Receive a Mystery Multiplier where all wins could be multiplied by 5x's or 10x's. or get the Rolling Reels™ feature where consecutive wins can increase the winning multiplier of up to 12x's. If the player receives 5 of a Kind anywhere on the reels, then you'll get an automatic 5 of A Kind Again. 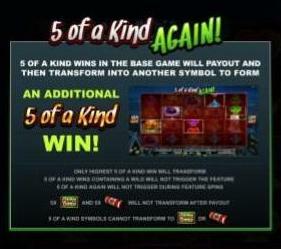 Receiving 5 of a Kind and 5 of a Kind Again could bring massive winnings. There is no Humbug to be seen with this video slot. Players will be spinning these wheels all year long.